BEST TRANSPERENCY - Reproduction is easier and prints are clear. BEST ERASING SURFACE - Ghost lines do not appear. EXCELLENCY COVERED SURFACE - No pin holes and absence of link penetration. Tracing cloth is manufactured from best quality materials. The drawing made on tracing cloth yeilds clear and briallant reproduction. Extensively used by architects, machine ship building industry, Railways, Municipal Corporation and PWD. India's leading architects and draughtsmen swaer by the all new tracing cloth. 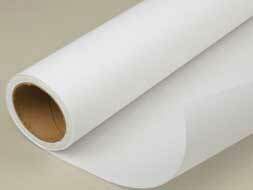 Simply because tracing cloth has a lot more inherent superior qualities compared to an ordinary tracing paper. « Drawing and tracing on tracing cloth do not lose clarity or colour even after storing them for years. Unlike tracing paper drawings which hardly stay good for a year. « Tracing cloth has definitely better handling characteristics than ordinary tracing paper. More it rarely crumples or forms wrinkles. « it is unaffected by harmful pests like rats, white ants, cockroaches etc. « Besides tracing cloth lends a better dimensional stability than tracing paper any day.